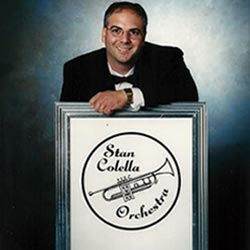 For over 40 years, the Stan Colella Orchestra has entertained capacity crowds throughout New York State pleasing them with their toe-tapping tunes. The Colella Orchestra has performed at various alumni functions, weddings, dinner dances, charitable fundraisers, as well as being the featured entertainment at several concerts, conventions and festivals. The band’s repertoire primarily accents music from the big band and jazz eras. The Orchestra consists of the most experienced professional musicians from Central New York and is multifunctional ranging from 5-pieces, 12-pieces, 16-pieces, or our POPS orchestra with a full string section.